BM-1101. Batman Begins movie poster tee shirt. Dramatic silhouette of Batman standing in front of a sunset. 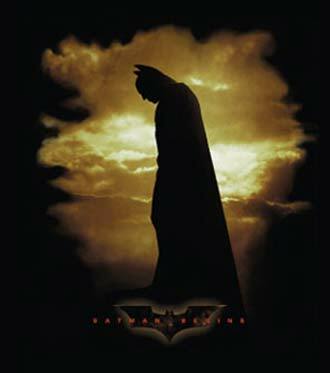 Wording beneath the image reads "Batman Begins" and has the Bat logo. Out of print movie merchandise tee shirt. Printed on pre-shrunk, 100% cotton, adult size black tee. Adult sizes Med - XL left in stock. Batman Begins movie poster tee shirt. Dramatic silhouette of Batman standing in front of a sunset. Wording beneath the image reads "Batman Begins" and has the Bat logo. Printed on pre-shrunk, 100% cotton, adult size black tee. Out of print movie merchandise tee shirt.